What kind of times are these in which one has to defend the obvious, Bertolt Brecht once said. Let’s start by remembering some things. For almost forty years, Spain has been a constitutional democracy, perfectly comparable to the democratic regimes of other countries of the European Union, of which it forms a part. The Constitution of 1978 was approved in a referendum by 88.54% of the voters throughout the country, and by 90.46% in Catalonia, where the votes against did not reach 5%. According to the Constitution, Spain has organized itself territorially as a widely decentralized state of regions, in which these ‘autonomous communities’ enjoy a high level of self-government. Catalonia is recognized as a historical ‘nationality’ and the competences that make up its self-government are included in the Statute of Autonomy. In order to guarantee self-government, the statute is constitutionally protected as part of what is known as the ‘constitutional block’. If, as in any complex state with several levels of government, conflicts arise between the central government and the governments of the autonomous communities as regards the distribution or exercise of powers, such conflicts have to be resolved by the Constitutional Court as arbitrator and interpreter of the Constitution, as is the case in Germany or Canada. Of course, the powers of self-government and the Statute itself are open to political debate and can be reformed, as it has happened, provided that it is done following legally established procedures and respecting the current constitutional framework, as is to be expected in any democratic country. Regrettably, what is happening today in Catalonia in relation to the call for the October 1st referendum is far from what should be expected in a normal democratic society. In order to force a unilateral secession from Spain, the Catalan government and the parliamentary groups that support it have decided to call an illegal referendum on that date. 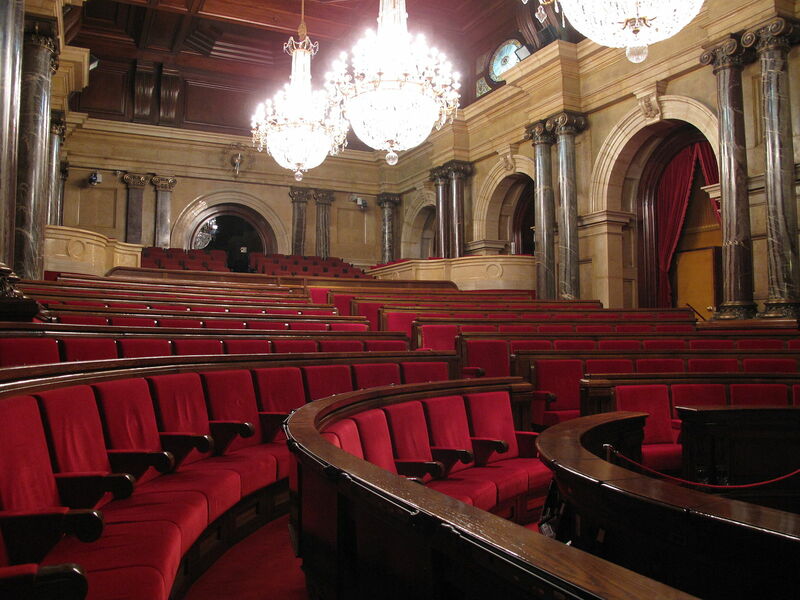 To do this, invoking the supposed right to decide, they passed the laws of both the referendum and the transition to independence in the sessions of September 6 and 7, skipping the requisite legal requirements, ignoring parliamentary procedure and without the least respect for the rights of parliamentarians of the opposition who were forced to leave the chamber in order to register their disagreement. And all this was done with a parliamentary majority achieved with only 47.8% – an insufficient share to either reform the electoral law or the Statute itself. The convocation of the referendum has been justified, with more or less feigned ingenuity, as the only way to consult the Catalans about independence. However, the laws passed not only refer to the holding of the vote but actually represent the declaration of independence itself. They convert the Catalan parliament into a de facto sovereign dictatorship, as Carl Schmitt would say, in the process suspending the Constitution and Statute of Autonomy in Catalonia and with it the civil and political rights of the citizens of that region. It should be emphasized that the partisans of secession present the call for a referendum as a democratic demand both innocuous and impeccably democratic. Despite the suspension by the Constitutional Court, the regional government and the secessionist parties have decided to continue with a referendum lacking either procedural or legal guarantees in what constitutes a clear challenge to the constitutional order. In addition, they encourage their supporters to disobey laws and mobilize to prevent the application of relevant legislation by authorities. This we have already seen in recent days. Initial disbelief has given way to alarm at what is happening. The abuses committed by Catalan authorities, acts of street disobedience, harassment of dissenters and, in general, the breakdown of coexistence. We are certainly faced with the most serious political crisis in Spain since the coup attempt of February 23, 1981. A simple review of the press in the last two weeks offers abundant testimony to this alarm on the part of analysts both calm and temperate and not given to grandiloquent excesses. To cite just a few examples: Lluís Bassets has explained that the institutions of self-government, starting with the supreme norm that is the Statute, have been invalidated in practice by those who swore to respect them. Joaquim Coll has long pointed out the insurrectional strategy of the independence movement and Daniel Gascón has described the secessionist project as a «postmodern coup d’etat.» A manifesto signed by more than two hundred professors from Spanish universities has drawn attention to the seriousness of the facts and the responsibility of the secessionists, whose attack on the Constitution and the Statute puts in serious danger the democratic coexistence and civil peace in Catalonia and in all Spain. And a few days ago Manuel Arias Maldonado expressed the feeling of vertigo that comes from witnessing, in a democratic and prosperous European society, scenes of crowds in the street as well as national-populist discourses more typical of the turbulent 30s of the last century. The perplexity that many feel in the face of these events can be summed up with some questions. How is it possible that this agitation manages to raise the flag of victimhood in a region with the among highest levels of well-being in Spain and one that enjoys a very large degree of self-government? How is it possible that a movement intended to destroy coexistence in a democratic and open society like Spain, whose citizens enjoy constitutionally guaranteed rights and freedoms similar to those of any advanced democracy? How is it possible that the autonomous government is attempting, in an exercise of political adventurism, to subvert the prevailing legality in a member state of the European Union, which is defined as a community of law and being the rule of law one of its fundamental principles?